Stay healthy this year by always keeping these foods in your kitchen. t When we get busy with our careers, our families and our social obligations, we sometimes just don’t have enough time to cook or make it to the grocery store. So when you know that your schedule is about to get busy, or if you always have a jam-packed day, here are a few key healthy foods to always keep in your kitchen. When you have healthy foods on hand, they will help support you on your health-and-wellness journey. t This is one of my favorite healthy foods, and I keep it in my cabinet at all times. 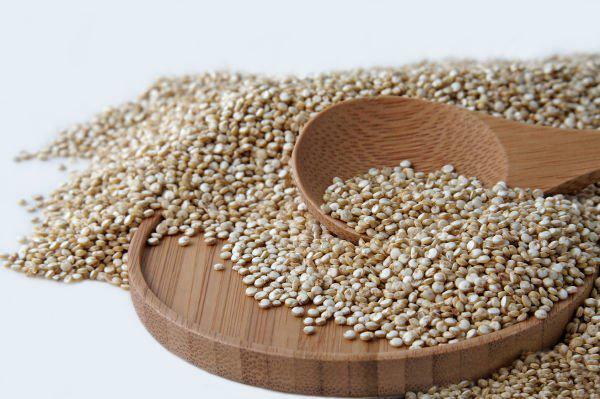 Quinoa is an amazing grain full of protein and fiber, and it’s gluten-free. It takes only 10 minutes to prepare, and you can have it as a side dish, on top of a salad or even as breakfast. Quinoa is bitter, so be sure to wash it first. You can also put a spoonful of coconut oil in the pan when you are making it to add some sweetness and healthy fats. t Beans constitute another great source of protein and fiber, and they’re super-easy to add into dishes. I would encourage you to buy beans in BPA-free lined cans, like the beans produced by Eden Farms. Make sure to wash your beans to get all the sodium off of them. You can add beans to salads and soups, and you can have them as a side dish, too. t When we get busy, we tend to feel a little stressed and overwhelmed. To help keep your hormones balanced and your stress levels down, add in some real chocolate: raw cacao. This superfood has tons of iron and magnesium, which balances your hormones and keeps you energized and happy. Raw cacao has no sugar in it, so you won’t gain weight or break out. You can add cacao powder into a smoothie or make some raw chocolate macaroons. I like to keep these in my fridge and eat one a day. t We need to eat a lot of healthy fats to keep our brains functioning and our moods balanced. It’s great to always keep avocados on hand because they are full of healthy fats, which keep your body satisfied and nourished longer. You can put avocados on your salads or in your smoothies, but my favorite way to serve avocados is on toast. A quick snack or meal would be some toasted Ezekiel bread. It is made from sprouts with avocado slices. t When we have a bunch of veggies in the fridge, we can cut them up and cook a quick meal by cooking with coconut oil. This oil is full of healthy fats and can withstand high temperatures, so it’s perfect for stir-frying veggies. You can cook up your chopped vegetables with coconut oil and toss in some quinoa as a side dish. You can also put coconut oil on Ezekiel bread or put it in your smoothie for some extra healthy fat. t Greens are missing from many of our diets, and they’re very important for good nutrition. Greens are high in calcium, magnesium, iron, potassium, zinc and vitamins A, C, E and K — which help to detoxify our body and give us long-lasting energy. You can get extra greens into your diet by making green smoothies, salads and sauteed spinach, or you can serve your favorite greens as an easy side dish. t One of the best ways to reduce sugar cravings in your body is to eat sweet veggies like carrots and sweet potatoes. They are also good sources of iron, vitamin C and magnesium (which is the relaxation and anti-stress mineral). They are also among the easiest foods to prepare. You can slice a sweet potato and make sweet potato fries, add them to a veggie dish or even bake a sweet potato and eat it for breakfast. Always keep them on hand as a quick, healthy food.